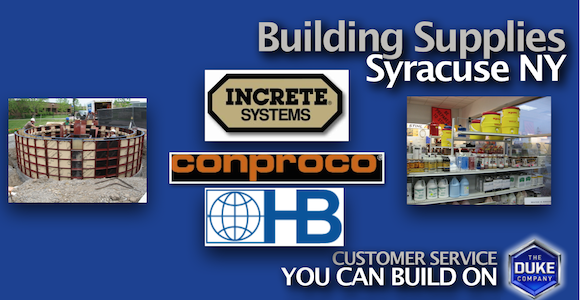 Looking for the best professional grade Building Supplies in Syracuse NY? Fast delivery, competitive prices, outstanding products, and expert advice from the Duke Company through-out Syracuse NY and Western NY. For outstanding service, the best prices and fast delivery, call 585-292-9870 or 607-347-4455. Our concrete forming division is available to assist you in professionally planning your job. Many professional contractors in Syracuse NY turn to the Duke Company for our wide-building supply selection, responsive service and expert advice – making us a one-stop shop for complete range of building supplies. In addition to building supplies, we rent a complete range of the best brand name equipment rental machines including excavators, Bobcats, wheel loaders, ground heaters and more. We look forward to earning your business through-out Western NY including Syracuse NY, Rochester NY, Ithaca NY and beyond.